Global Plastic Pallets Market 2018-2022, has been prepared based on an in-depth market analysis with inputs from industry experts. The report covers the market landscape and its growth prospects over the coming years. The report also includes a discussion of the key vendors operating in this market. A pallet is a flat base panel that is used to serve as the base for the storage and transportation of raw materials and finished goods. Pallets are generally designed to be lifted by forklifts and pallet jacks. They are used as a returnable transport packaging material. These pallets are material handling equipment for the movement of goods and raw materials within a warehouse or between distribution centers. The increased use of palletized storage and transportation are the key considerations that are fueling the demand for pallets in transit packaging by different end-user industries. The growing need for efficient and safe storage and transportation is driving the global pallets market, especially for the end-user industries, such as food and beverage, chemicals, cement, pharmaceuticals, oil and gas, and automotive industries. The Global Plastic Pallets Market to grow at a CAGR of 7.70% during the period 2018-2022. The report covers the present scenario and the growth prospects of the global plastic pallets market for 2018-2022. 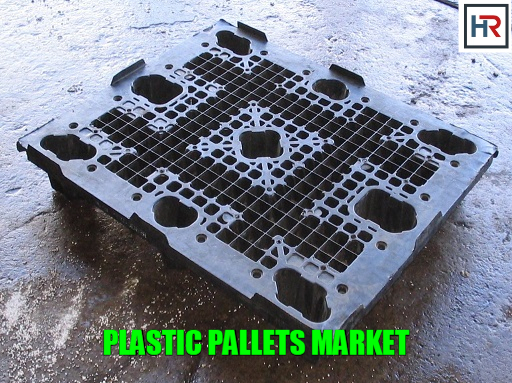 To calculate the market size, the report considers the revenue generated from the sales of plastic pallets.